Making Southern brides beautiful is top priority for hat designer Missy DuBois, but sometimes her Louisiana studio moonlights as a crime-solving headquarters . . . 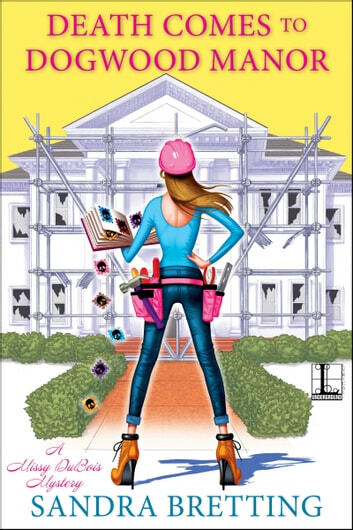 While driving to her hat shop, Crowning Glory, Missy accidentally sideswipes a car parked in front of Dogwood Manor, an antebellum mansion being converted into a high-end hotel by the much-reviled property developer Herbert Solomon. Of course, the car is his Rolls Royce. But Solomon is too busy berating his contractor and interior designer to worry about a little fender bender. When Missy returns to check out the mansion’s chapel where her latest client will be married, she finds the developer dead on his property. After an autopsy finds poison in his body, Missy’s shop is then flooded right before it’s supposed to be featured in an article about wedding-veil trends. Now before everything becomes sheer disaster, she’ll have to train her sights on finding a killer . 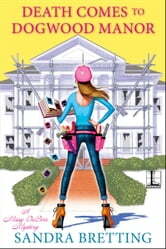 . .
Let us take a trip to Bleu Bayou, Louisiana to visit Missy DuBois, milliner and amateur sleuth. Missy runs the Crowning Glory boutique where she designs hats and veils. Her significant other, Ambrose ‘Bo’ Jackson who designs wedding dress works in the same complex. On the way to work, Missy stops at Dogwood Manor. This is an old antebellum house that is being renovated by billionaire Herbert Solomon. Herbert is not well liked. Later in the day Missy returns to the Manor where she discovers the billionaire dead in a small bedroom in the Manor. How did he die? With so many people not liking him, the suspect list is lengthy. Vivid, colorful, quirky, well defined cast of characters involved in a complex mystery. Well written, detailed description, southern charm, southern dialect and sayings plus southern sweet ice tea, fried chicken and jambalaya. I was immediately drawn into this delicious read. This is book # 4 in A Missy DuBois Mystery series.It can be read as a stand alone. I volunteered to read an advance copy of the book. Thanks to author via the Cozy Mystery Review Crew for the book. My opinion is my own. Things are heating up in the south especially when everyone's least favorite billionaire keels over! Missy once again finds herself in the thick of things as she finds the body and helps her friend who is a deputy unravel the mystery of the man's death. Humor, southern charm and relatable characters keep you interested in a well developed plot with multiple suspects to keep you guessing! Definitely a great book to keep you entertained for the day and if you haven't read the series, you definitely should as the series is a fun way to spend a few days entertaining your brain in a series of "whodunits!" I'm looking forward to the next book in the series already! Death Comes to River Road. Death Comes to Dogwood Manor is was a delightful mystery with easily relatable characters. I love books that center around the wedding business and the idea of someone who creates wedding veils and those fascinators that royal weddings have made popular offers a unique take on a favored cozy mystery sub-genre. In typical cozy fashion, Misty manages to trip over bodies at River Road mansions that her clients use as wedding venues. For a different feel, local law enforcement appreciates her input on the crimes. I know it is not realistic but I enjoy this different slant and, knowing how different life is in small towns, can image it happening with long time friends. He boyfriend Bo is great and the romantic element is sweet but you know that in the background things can get hot. It is wedding season and Misty is swamped so the last thing she needs is to stumble over another body but that doesn't keep her nosiness in check or keep her from turning up another body. The late owner of the current venue was a true grumpy old man so the number of suspects is almost endless. A frustrating bride, a magazine interview and disaster do not leave time for a murder investigation and a real life so it is the life that has to be sacrificed. Fortunately for Misty that is just a figure of speech but food, sleep, and romance are not things she wants to give up. This series is definitely for avid cozy readers to check out. I received a copy of this book from the author but it is the fun I had reading it that make me want to share it with my friends.